I’ve been going back to Texas twice a year for Antique Alley for 3 years now. This year I decided that since I was buying a plane ticket I should find a show the week before or after and just stay for two weeks. Luckily, this year South Central Texas Vintage Market Days Waxahachie was the week after. This was my first show to do in a dirt floor barn. This is actually the space next to me because I forgot to take a picture before I started setting up. 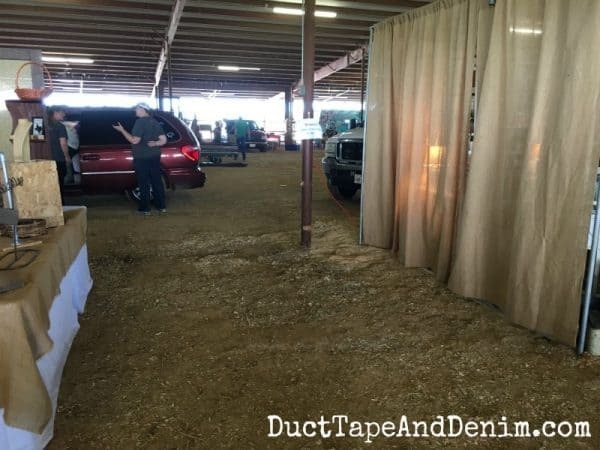 But my booth looked just like this, 10′ x 10′ on dirt. I set up the tables in a U and stacked my boxes in the middle to set up. You’ll recognize my sister’s screen doors in the back and all my displays from Antique Alley. I store all these at my dad’s house so I can fly with just my jewelry when I go to sales in Texas. Here’s the space all finished. 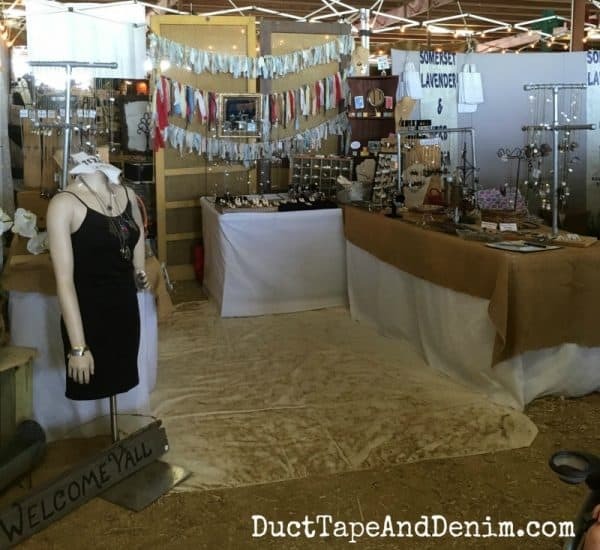 The organizers suggested using a drop cloth as a rug to hold down the dust. And there was a lot of dust! 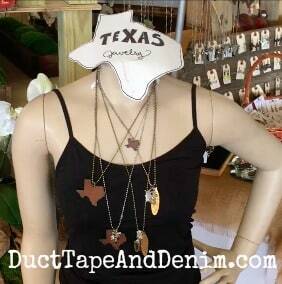 For my next show on dirt I may just put out one of each item so all the jewelry won’t get so dusty. 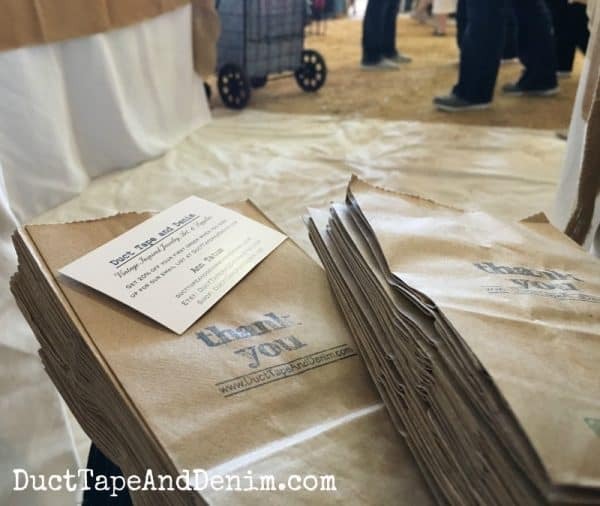 Before traffic picked up too much I stuffed my stack of bags with my special coupon code business cards. Make sure you take a look at My Current Show Schedule. I’m planning my fall shows now! And you can find my jewelry every day in my Etsy shop. 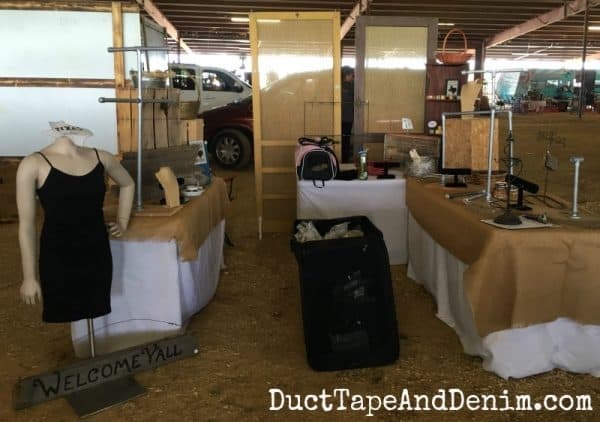 Do you sell at shows? I’d love to hear your suggestions for barn sales.